Who averaged the most minutes per game in 2016-17? Hint: The 32-year-old blueliner (who wears No. 33) was 18 seconds ahead of his nearest competitor. Winnipeg’s big man on the blue line took 29.1 shifts per game in 2016-17, while averaging 57 seconds per shift. 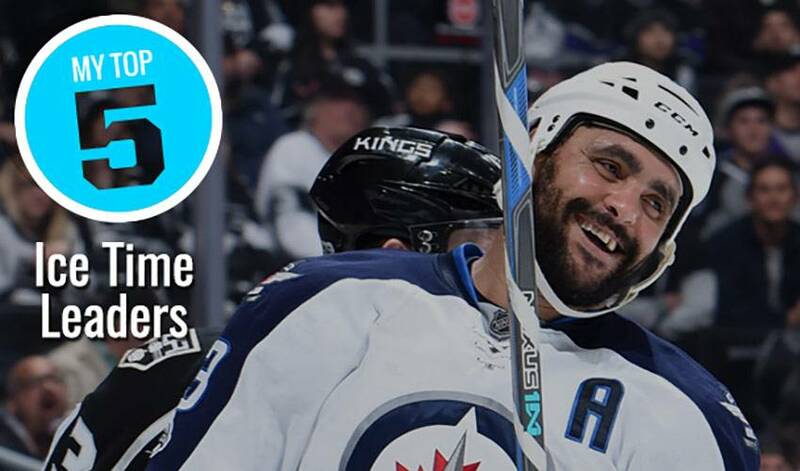 In 80 games with the Jets, Byfuglien, who hoisted the Stanley Cup with Chicago in 2010, netted 13 goals and contributed 52 points, along with a plus-10 rating. Los Angeles savvy veteran rearguard led all players in total ice time in 2016-17, racking up 2225:50 over 82 games. Doughty delivered some offensive pop as well, scoring 12 goals and recording 44 points. A two-time Stanley Cup champion, the 27-year-old won the 2016 James Norris Memorial Trophy as the league’s top defenceman. Once again, Suter was counted on to deliver in all situations for the Minnesota Wild. He tied for top spot in plus/minus (+34), while averaging 57 seconds per shift in 2016-17. In 913 career NHL regular season games, the Wisconsin native has 442 points. Ottawa’s superstar captain had a brilliant 2016-17 campaign. Highlights included 17 goals and 71 points in 77 games, along with five game-winning goals. A two-time (2012, 2015) Norris Trophy recipient, Karlsson took 31.5 shifts per game last season. Buffalo’s emerging talent on the blue line had a sensational 2016-17 season with the Sabres. A native of hockey-rich Turku, Finland, Ristolainen contributed 39 assists and 45 points (both career-best marks) in 79 games. He tied for 14th in the league with 2:59 of short-handed ice time per game.